Why would anyone disable ACPI support on a server machine?? Well ACPI support kernel loaded code is just another piece of code constantly being present in the memory, that makes the probability for a fatal memory mess up leading to a fatal bug resulting in system crash (kernel panic) more likely. Many computers ship with buggy or out of specifications ACPI firmware which can cause a severe oddities on a brand new bought piece of comp equipment. One such oddity related to ACPI motherboard support problems is if you notice your machine randomly powering off or failing to boot with a brand new Linux installed on it. Another reason to switch off ACPI code will would to be prevent the CPU FAN rotation from being kernel controlled. If the kernel controls the CPU fan on high CPU heat up it will instruct the fan to rotate quickly and on low system loads it will bring back the fan to loose speed. This frequent switch of FAN from high speed to low speed increases the probability for a short fan damage due to frequent changes of fan speed. Such a fan damage leads often to system outage due to fan failure to rotate properly. Therefore in my view it is better ACPI support is switched off completely on servers. On some servers ACPI is useful as it can be used to track CPU temperature with embedded motherboard sensors with lm_sensors or any piece of hardwre vendor specific software provided. On many machines, however lm_sensors will not properly recognize the integrated CPU temperature sensors and hence ACPI is mostly useless. There are 3 ways to disable fully or partially ACPI support. 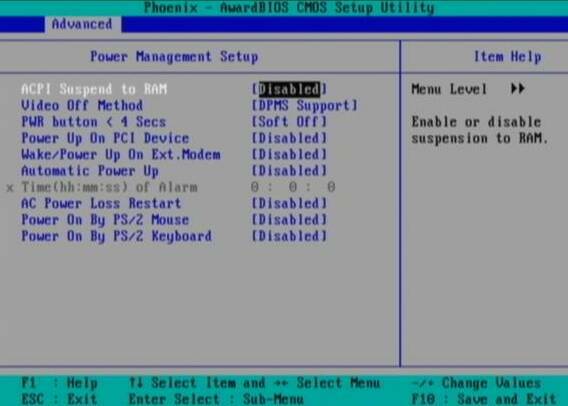 Press DEL, F1, F2, F10 or whatever the enter bios key combination is go through all the different menus (depending on the vios BENDOR) and make sure every occurance of ACPI is set to off / disable whatever it is called. This is the in my opinon best and safest way to disable ACPI power saving, Unfortunately some newer PCs lack the functionality to disable ACPI; (probably due to the crazy "green" policy the whole world is nowdays mad of). If that's the case with you, thanksfully there is a "software way" to disable ACPI via passing kernel options via GRUB and LILO boot loaders. There is a tiny difference in command to pass in order to disable ACPI depending on the Linux installed GRUB ver. 1.x or GRUB 2.x. to the end of kernel command line. The kernel option root=/dev/VolGroup00/LogVol00 means the the server is configured to use LVM (Logical Volume Manager). This version is by default installed on newer Ubuntu and Debian Linux-es. In grub 1.99 on latest Debian Squeeze, the file to edit is located in /boot/grub/grub.cfg. The file is more messy than with its predecessor menu.lst (grub 0.99). ACPI is the system that controls your dynamic speed fans, the power button behavior, sleep states, etc. APIC is the replacement for the old PIC chip that used to come imbedded on motherboards that allowed you to setup interrupts for your soundcard, ide controllers, etc. Anyways, while doing the changes, be very very cautious or you might end up with un-boot-able server. Don't blame me if this happens :); be sure you have a backup option if server doesn't boot. To assure faultless kernel boot, GRUB has ability to be configured to automatically load up a second kernel if 1st one fails to boot, if you need that read the grub documentation on that. Still, some Linux distros like Slackware, decided to keep the old way and use LILO (LInux LOader) as a default boot loader. insserv: Script iptables is broken: incomplete LSB comment. insserv: missing `Required-Start:' entry: please add even if empty. insserv: warning: current start runlevel(s) (empty) of script `acpid' overwrites defaults (2 3 4 5). insserv: warning: current stop runlevel(s) (2 3 4 5) of script `acpid' overwrites defaults (empty). I'm not sure if this is safe,as many newer rpm based server system services, might not work properly with haldaemon disabled. Anyways you can give it a try if when it is stopped there are issues just bring it up again. If you are a system administrator, you have probably wondered at least once ohw to configure your Linux server to automatically reboot itself if it crashes, is going through a mass CPU overload, e.g. the server load average “hits the sky”. I just learned from a nice article found here that there is a kernel variable which when enabled takes care to automatically restart a crashed server with the terrible Kernel Panic message we all know. The variable I’m taking about is kernel.panic for instance kernel.panic = 20 would instruct your GNU Linux kernel to automatically reboot if it experiences a kernel panic system crash within a time limit of 20 seconds. debian-server:~# sysctl -p There you go automatic system reboots on kernel panics is now on. You might consider checking out this auto reboot tutorial which explains in simple words how watchdog is installed and configured. Well that should be it, you might also need to load some kernel module to monitor your watchdog. It’s best if you load the module while the softdog daemon is disabled.